Feeling adventurous? 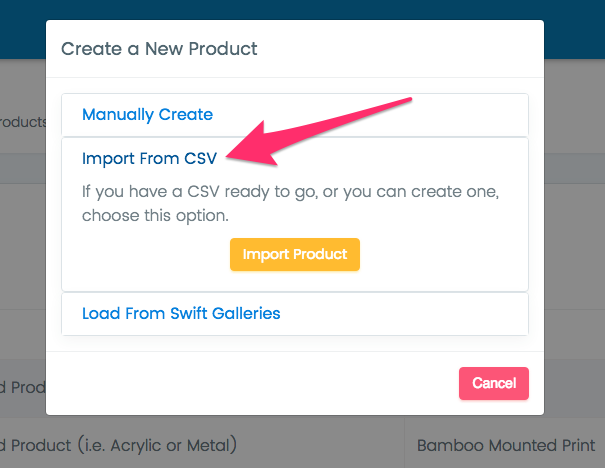 Learn how to create and import products via CSV. This method is really only for the power users who are comfortable working with CSV files and want to roll their own Product Files (grab our template Product File right here). You can only have one product type per file. Every variation will need its own product file (ex: multiple frame color options for framed prints). Your file must be saved in CSV format. If you use commas in any fields, be sure your CSV software encloses that field in quotations to avoid any issues. Your file must use our specific header row. It's easiest to just download our template file and use it as your starting point. The Product Type Classification entries must be either "Wrapped", "Non-wrapped" or "Framed". Those are case-sensitive, as well. The Product Type Measurement System must be either "Inches" or "Centimeters". Those are also case-sensitive. 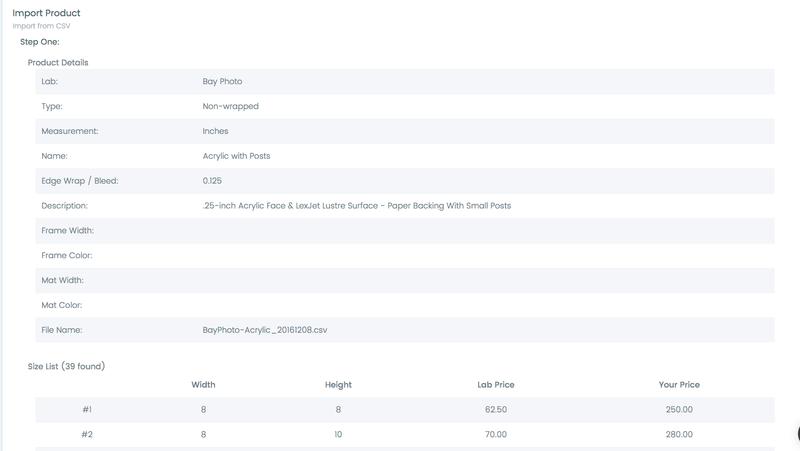 All fields are required except for Frame Width, Frame Color, Mat Width and Mat Color, which are only required when your Product Type Classification is "Framed". If you run into any problems, feel free to shoot us an email with your Product File attached and we'll be happy to help you troubleshoot any issues. If you started your Swift Galleries account with products already loaded for you, you may already have products in your account. No matter which option you choose, you'll navigate to Products and Templates, then to Manage Products. ‍Click on Add a Product, then Import from CSV, then Import Product. Choose the product color that will represent this product in the Template Manager as well as the Templates tab in the Designer, then click "Finish Importing my Product". Then confirm. That's it! You'll be dropped in on the Sizes grid where you can change your prices or delete or add any different sizes if you'd like.